From secrecy and deception in high places, come home, America. From military spending so wasteful that it weakens our nation... come home, America... Come home to the conviction that we can move our country forward. 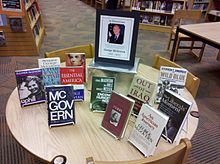 George Stanley McGovern (July 19, 1922 – October 21, 2012) was an American historian, author, U.S. Representative, U.S. Senator, and the Democratic Party presidential nominee in the 1972 presidential election. As a senator, McGovern was an exemplar of modern American liberalism. He became most known for his outspoken opposition to the growing U.S. involvement in the Vietnam War. Throughout his career, McGovern was involved in issues related to agriculture, food, nutrition, and hunger. As the first director of the Food for Peace program in 1961, McGovern oversaw the distribution of U.S. surpluses to the needy abroad and was instrumental in the creation of the United Nations-run World Food Programme. As sole chairman of the Senate Select Committee on Nutrition and Human Needs from 1968 to 1977, McGovern publicized the problem of hunger within the United States... which led to a new set of nutritional guidelines for Americans. McGovern was appointed the first UN global ambassador on world hunger by the World Food Programme in 2001. The McGovern–Dole International Food for Education and Child Nutrition Program has provided school meals for millions of children in dozens of countries since 2000 and resulted in McGovern's being named World Food Prize co‑laureate in 2008. We are the party that believes we can’t let the strong kick aside the weak... Our party believes that poor children should be as well educated as those from wealthy families. We believe that everyone should pay their fair share of taxes and that everyone should have access to health care... With the country burdened economically... there has never been a more critical time in our nation’s history” to rely on those principles. I don’t think the American people had a clear picture of either Nixon or me...I think they thought that Nixon was a strong, decisive, tough-minded guy, and that I was an idealist and antiwar guy who might not attach enough significance to the security of the country. The truth is, I was the guy with the war record, and my opposition to Vietnam was because I was interested in the nation’s well-being. I think the Vietnamese are better off in Vietnam. Defense conversion is most closely associated with South Dakota Democrat and 1972 presidential candidate George McGovern, who made it his signature issue in Congress. A recession in the mid-1950s and the military cuts following the Cuban missile crisis gave him the opportunity to push the idea through the Senate, and in 1964 he called for a National Economic Conversion Commission (NECC) that would oversee the work. McGovern wanted to get the defense industry out of job creation, recognizing, as many liberal and conservative elites did privately, that the military-industrial complex was essentially a “gigantic WPA.” McGovern also wanted to free up hundreds of millions of federal monies for domestic welfare, to shore up the welfare state. But the Vietnam War killed the project, as his fellow Democrats denounced him as a “radical” in the middle of a war. Bill Clinton, who started his political career with McGovern, expressed interest in cutting defense to invest in transportation infrastructure, including “a high-speed rail network.” Yet again, however, liberals and conservatives proved no different in government, voting to keep the military-industrial complex going, even though the United States had become the world’s first truly uncontested superpower. A slender, soft-spoken minister’s son newly elected to Congress — his father was a Republican — Mr. McGovern went to Washington as a 34-year-old former college history teacher and decorated bomber pilot in World War II... with ... a brand of politics traceable to the Midwestern progressivism of the late 19th century. Elected to the Senate in 1962, Mr. McGovern voted consistently in favor of civil rights and antipoverty bills, was instrumental in developing and expanding food stamp and nutrition programs, and helped lead opposition to the Vietnam War in the Senate. To the liberal Democratic faithful, Mr. McGovern remained a standard-bearer well into his old age, writing and lecturing... insisting on a strong, “progressive” federal government to protect the vulnerable and expand economic opportunity, while asserting that history would prove him correct in his opposing not only what he called “the tragically mistaken American war in Vietnam” but also the American invasions of Iraq and Afghanistan. ...“soft” on defense. 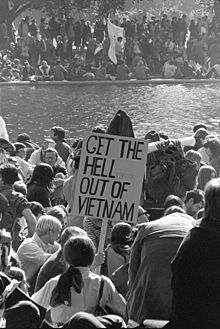 For forty years now, Democrats have sought to avoid the label that was attached to George McGovern, the World War II hero who recognized the folly of squandering America’s human, moral and fiscal prospects on war-making in Vietnam. It is true that McGovern lost his 1972 presidential race. But he did not lose because he was wrong. He lost because of the wrong politics of a moment when his own party was divided and his opposition was ruthless. The wisdom and hope that was inherent in McGovern’s call that year was not sufficient to defeat Richard Nixon. In a matter of months, however, polls would reveal that Americans regretted their decision, as they came to recognize the extent of Nixon’s corruption. Forty years on, McGovern’s vision that America might come home to the ideals that had nourished it from the beginning is less a matter of hope than necessity. Nixon Library's Oral History with George McGovern (1 h 14 min) . Transcript of McGovern's acceptance speech at the 1972 Democratic National Convention.